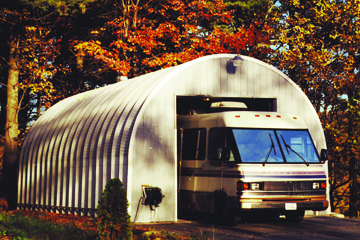 Recreational Vehicle Metal Buildings to provide ultimate protection of your investments! U.S. Buildings can provide metal buildings for all of your recreational building needs. Many of our metal building customers choose our clear span steel buildings as a high quality garages to park and protect their vehicles from the elements or as an outdoor storage building for extra storage space to free up their homes and garage. The most popular use for our recreational metal buildings is a separate, backyard garage used to house anything from a body shop to your antique car collection or your RV. Some customers have even used our building kits to build the workshop they’ve always wanted while some have used our heavy- gauge galvalume steel buildings as a guest house or even their own home. Whatever your building needs may be, you can be sure that U.S. Buildings has the most durable, affordable and versatile metal buildings on the market.